The newly opened Hyundai Motorstudio Goyang near Seoul utilizes arco’s IOSONO immersive sound to create a multisensory experience in its new flagship showrooms. The main exhibition of Hyundai Motorstudio Goyang lets visitors explore different development steps of a car. Telling the stories behind the car, the interactive exhibits range from design to assembly and even include a 4D car race. The exhibition’s sound chamber features a Barco IOSONO system, allowing visitors to explore the development and importance of car sound design. Car sounds and music compositions play back from the 3D sound system, synched with a colorful light animation. The sound system includes Barco’s IOSONO CORE audio processor and 60 JBL AC15 speakers that were integrated into the wall structure to be nearly invisible. To envelop visitors in the sounds, the speakers are placed in three layers from floor to ceiling. 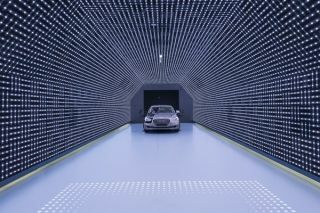 Hyundai Motorstudio Goyang expects up to 2,000 daily visitors.